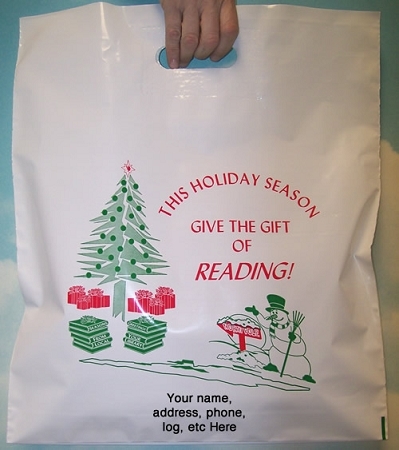 16" x 18" x 3" Bottom gusset x .003 White Patch Handle " This Holiday Season Give the Gift of Reading" with your message printed in a 3" x 5' area in black on one side of the bag Packed 250 per case. NOTE: First Time Orders For Semi-Custom Imprints Require Customer Approval Before Printing. After Customer Approves Proof, Please Allow 10-14 Working Days For Production Time.